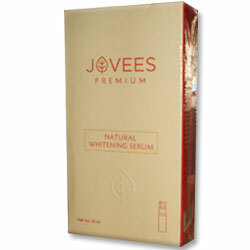 Jovees Herbal Serum - Worldwide Shipping. This Whitening Natural Serum is formulated with high quality herbs and botanicals that work in synergy to fundamentally improve skin quality. It resists against visible concerns such as uneven skin tone, dullness, and sunspots, while reducing the appearance of skin discolorations. A fast acting serum that evens skin tone and diminishes dark spots to impart overall radiance and luminosity to the skin. Apply all over the face and neck twice a day and leave on. Liquorice root powder, Mulberry fruit powder, Grape leaf powder, Bearberry leaf extract, Wheat protein, Black bearberry extract, Sea weeds powder.